Multnomah County may have a fifth person infected with measles, county health officials said Sunday. Four people have been diagnosed with measles who were exposed to the highly contagious virus from the Clark County outbreak. This latest case is being treated as a confirmed case, bringing the county’s county up to five so far in 2019, but is not confirmed. However, health officials say that the person shows enough indications of measles to notify the public of places where the possibly infected person visited. Measles travels through air and can linger in an enclosed space for up to two hours. Portland International Airport: Tuesday, Feb. 19, 9 p.m. to 10:30 p.m.
Randall Children’s Hospital at Legacy Emanuel emergency department: 10:30 p.m Tuesday, Feb. 19 to 2:30 a.m. Wednesday, Feb. 20. The Vancouver-area measles outbreak has spread to Oregon. Seventy people — the vast majority of whom are children — have gotten measles since an outbreak started in the Vancouver area on Jan. 1. Four of those were in Multnomah County and one was in the Seattle area. Nine out of 10 unvaccinated people who are exposed to the virus will contract it, according to the Centers for Disease Control and Prevention. For every 1,000 people who get measles, one to two die. The vast majority of people affected by the current outbreak were not vaccinated against the virus. Two people had one dose of the vaccine, which is 93 percent effective. 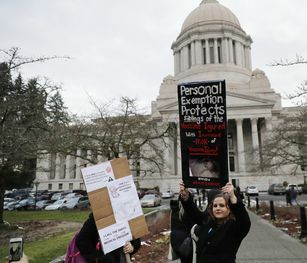 Two doses are 97 percent effective, and public health officials in Washington recommend that everyone who is unvaccinated or only received one get both shots to avoid contracting measles. The vaccine can reduce the risk of infection if gotten within 72 hours after exposure to the virus. To help prevent further spreading of the disease, health officials ask that people who think they might have measles call their doctor or health care provider before going to a hospital or doctor’s office.